Iceland has witnessed an explosion in tourism since the eruption of the Eyjafjallajökull volcano in 2010, which coincided with a collapse of the currency, the Króna following the financial crisis there. Having peaked in 2017 the growth rate has reduced considerably so far in 2018, and the country of origin of many of the visitors is changing away from mature markets. This development comes as key decisions have to be made about infrastructural investment to cope with tourist demand that could fizzle out, or could merely be temporarily paused. It is time for big decisions to be made that will shape the future of Iceland. CAPA Comment: The combination of the two, predominantly sixth freedom, Icelandic airlines will greatly strengthen the potential for growing the hub role of Reykjavik Keflavik International Airport. Operating in tandem should make the combination much more sustainable and a powerful North Atlantic operator. "Icelandair Group has entered into a share purchase agreement to purchase all shares in the airline WOW air. The acquisition is subject to, approval by Icelandair Group‘s shareholders, the approval of the Icelandic competition authorities and a due diligence. 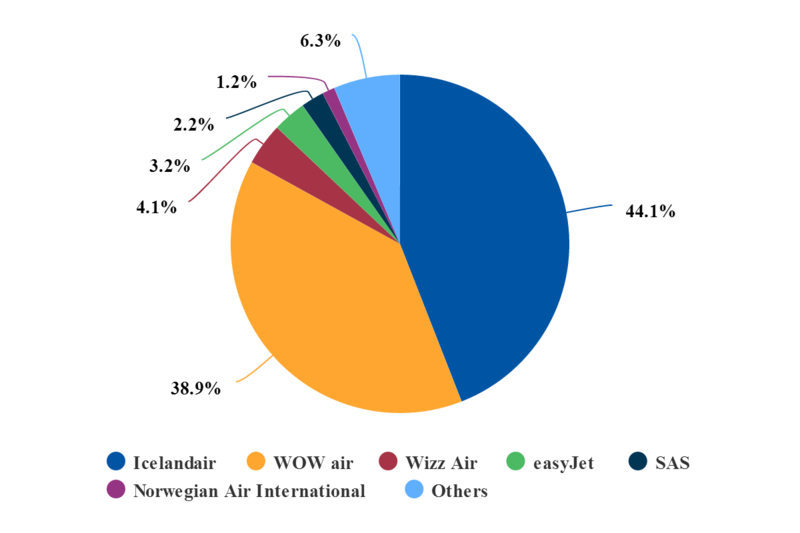 As consideration for the shares, the shareholders of WOW air will, subject to conditions, receive a total of 272.341.867 shares or the equivalent of 5.4% of Icelandair Group‘s shares after the transaction. Thereof, 178.066.520 shares or 3.5% of the shares as consideration for the sold shares. The consideration can increase to 4.8% or decrease to 0.0% in accordance with certain conditions set forth in the share purchase agreement. 94.275.347 shares or 1.8% of the shares will be paid due to conversion of a subordinated loan into equity. All of sellers’ shares in Icelandair Group will be subject to restrictive covenants for 6 months and half of the shares will be subject to restrictive covenants to further six months. "The companies will continue to operate under separate brands. Their combined market share on the transatlantic market is around 3.8%. The acquisition creates opportunity for both companies to become even better prepared to provide international carriers with strong competition in the international airline market. "In the upcoming days, Icelandair Group‘s will convene a shareholders‘ meeting where Icelandair Group‘s shareholders will cast their vote on the acquisition. A shareholders’ meeting shall be convened with at least three weeks‘ notice." Icelandic tourism looks likely to hit a trough in 2018 after years of spectacular growth. Statistics suggest that the country of origin of visitors is moving away from ‘mature markets’, with the exception of the U.S.
With a commitment to heavy expenditure on transport infrastructure, some important decisions have to be made. The privately owned flag carrier Icelandair has been a beneficiary of the boom, along with WOW Air, which has become the second largest airline at Keflavik Airport, handling almost 40% of capacity. Two decades ago Icelandair was a near monopoly airline at the airport, with only SAS offering any competition. Airlines designated by the U.S. and UK (prior to the EU Open Skies final package) even declined to take up their rights to operate to Iceland. Apart from incursions by American, Delta, United and Air Canada (although they are seasonal and the high season in Iceland is short – May to September) and a host of European low cost airlines (though again, mainly seasonal), the two main Icelandic airlines have thrown their capacity at the U.S. market in particular. 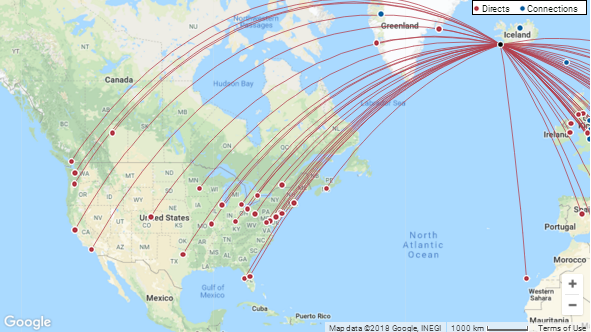 The route map below shows 21 U.S. destinations operated between the Icelandic airlines and the U.S. airlines, some of which are duplicated. They include small ‘hip’ cities such as Portland and Austin, which would struggle to justify direct flights from major European cities (both airlines offer ‘sixth freedom’ transit via Keflavik) and some that have made a comeback, such as Icelandair’s Baltimore-Washington route – which was abandoned when Icelandair’s U.S. Headquarters moved from Columbia, Maryland – but was more recently reinstated. There are casualties, of course. WOW Air suspended five routes from 25/26-Oct-2018 (Cincinnati, Cleveland, Dallas-Fort Worth and New York JFK) and will suspend St Loius on 06-Jan-2019. San Francisco has already been discontinued for winter 2018/19. There is clearly overcapacity on some thinner routes. Icelandair remains bullish, and will increase capacity to both the U.S. and Canada in summer 2019. The U.S. has certainly performed well for Icelandair and for tourism in Iceland as a whole. It is a mature market now, but there still remain some opportunities for new routes. 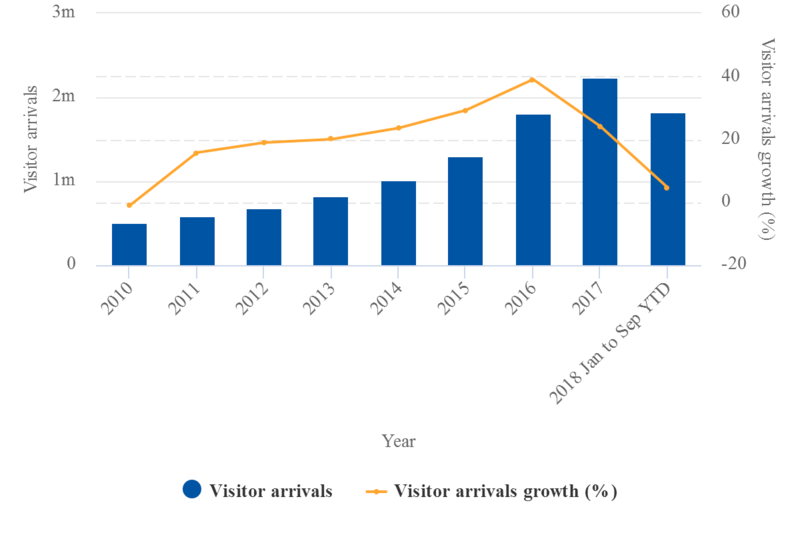 In Sep-2018 the number of visitor arrivals (all airlines) from the U.S. through Keflavik Airport was 82,346 – an increase of 43.7%. And that amount is 35.5% of the entire visitor total. This statistic stands in sharp contrast to other mature markets such as Sweden, Norway, the Netherlands and the UK, as well as newer ones such as France, as indicated in the table below. Several Icelandair routes to the UK, such as Birmingham and Belfast, have been suspended for business reasons. Tourism seems to have peaked at 2.22 million in 2017, an increase of 24.1%; although, in 2016 the increase was a staggering 39%. So far in 2018 (Jan-Sep), it is just 4.6%. A lack of air transport capacity cannot be blamed, though other shortcomings might be. Source: CAPA - Centre for Aviation and Icelandic Tourist Board. Tourism may turn out to be a victim of its own success. Despite a considerable programme of hotel building, had it not been for the supply of many new apartments that were erected and bought specifically to let, or partially to rent out, through companies such as airbnb, Reykjavik might not have been able to keep up with accommodation demand. As it is, rooms are in short supply and are thus expensive. Fortunately, a visitor can still get 119 ISK (Króna) to the dollar (USD) or 156 to the pound (GBP) and the trend is positive for tourists. In the 1990s the rate was ISK100 to the GBP which made the country viable only for less price conscious tourists or those who would pay whatever price was necessary for the opportunity to walk in the spectacular countryside. The table also demonstrates that there are two growing markets: Spain and China. The Chinese one offers the greatest promise. While there were only 8,243 Chinese visitors, the increase (27.9%) was the biggest of all. The Chinese are attracted to ultra clean, well organised, thinly populated semi-rural environments, which contrast dramatically with their own polluted, overcrowded mega-cities. Surprisingly, there are no direct flights to and from China, and it could well be that both Icelandair and Wow Air are missing an opportunity here. There are no services at all further east than Tel Aviv. As for accommodation, the Chinese would simply build it themselves. Assuming, of course, that is what the Icelanders want. In 2011 Iceland blocked a bid by Chinese billionaire Huang Nubo to buy 300 sq km of wild heathland in the east of the country following concerns that the vast land sale would give Beijing a “strategic foothold” in the North Atlantic. The Tourist Office, the airlines and Isavia – the airport and air traffic control authority – will be watching these visitor figures closely. At a time when the government is committing to a large but belated expansion of Keflavik Airport and a high-speed rail line between the airport and downtown Reykjavik, just who the tourists will be in the future, where they will come from, and how many of them there will be, will need to be estimated with great accuracy. Meanwhile, there appear to be many fresh markets for WOW and Icelandair to exploit.